The electronically adjustable EFX ramp changes the slope of the elliptical stride, letting you thoroughly cross-condition the large muscles of your lower body and achieve your desired heart rate quickly. The Precor EFX is the only elliptical machine that allows the user to vary muscle involvement by increasing or decreasing ramp incline, changing ramp resistance, changing foot placement on the footplates or by going forward or backward. Elliptical fitness crosstraining is an excellent activity for those new to exercise, yet it can offer an extremely challenging and diverse workout for those pursuing new levels of fitness. 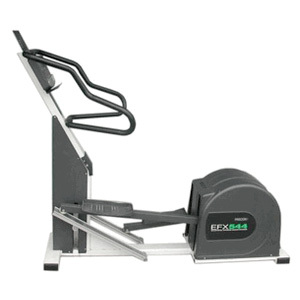 The incredible versatility, comfort, and fun that characterize the EFX have made it one of the most popular cardiovascular machines ever invented.